This composite of visible (or optical), radio, and X-ray data reveals the giant elliptical galaxy M87. PASADENA, CALIF. ? The most massive black hole yetweighed lurks at the heart of the relatively nearby giant galaxy M87. Thesupermassive blackhole is two to three times heftier than previously thought, a new modelshowed, weighing in at a whopping 6.4 billion times the mass of the sun. Thenew measure suggests that other black holes in nearby large galaxies could alsobe much heftier than current measurements suggest, and it could help astronomerssolve a longstanding puzzle about galaxy development. "Wedid not expect it at all," said team member Karl Gebhardt of the University of Texas at Austin. Thediscovery was announced here today at the 214th meeting of the AmericanAstronomical Society. The finding"is important for how black holes relate to galaxies," said teammember Jens Thomas of the Max Planck Institute for Extraterrestrial Physics in Germany. "If you change the mass of the black hole, you change how the black holerelates to the galaxy." Because ofthis relationship, the revised mass could impact astronomers' theories of howgalaxies grow and form. Higherblack hole masses could also solve a paradox of the masses of faraway,developing galaxies called quasars.These mysterious denizens of the early universe are very bright, developinggalaxies with black holes surrounded by gas and dust, all rife with starformation. Quasars are colossal, around 10 billion solar masses, "but inlocal galaxies, we never saw black holes that massive, not nearly,"Gebhardt said. "Thesuspicion was before that the quasar masses were wrong," he said. But"if we increase the mass of M87 two or three times, the problem almostgoes away." M87 is 50 million light-years away. Nearlythree decades ago, it wasone of the first galaxies suggested to harbor a central black hole. Nowastronomers think that most large galaxies, including our ownMilky Way, have supermassive black holes at their centers. M87 also has anactive jet shooting light out of the galaxy's core, created where matterswirls closer to the black hole and approaches the speed of light, thencombines with tremendous magnetic fields. The spat-out material helpsastronomers understand how black holes attract and gobble up matter, a sloppyprocess in which all is not consumed. 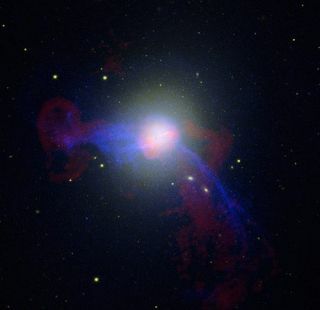 Thesefactors make M87 "the anchor for supermassive black hole studies,"Gebhardt said. While thenew mass of M87 is based on a model, recent observations from the Gemini NorthTelescope in Hawaii and the European Southern Observatory's Very LargeTelescope in Chile support the model findings. The studyof M87's mass will also be detailed later this summer in the journal AstrophysicalJournal.